Introducing a new free button pack for your next project! It includes 11 colors, each with 4 states (normal, hover, active and disabled), all in PNG format. Photoshop documents (PSDs) are also in the pack so you can customize the buttons to your own desire. On top of that, a Photoshop Action (ATN) file is also included to help you export each button state into separate images. The work is licensed under a Creative Commons Attribution 3.0 Unported License. 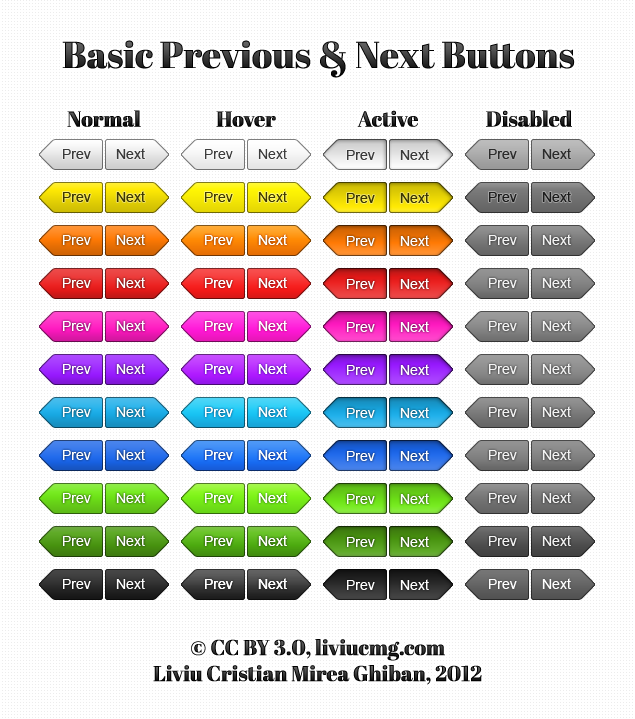 Download it here for free here: Basic Previous & Next Buttons, v1. And below is a preview. Enjoy!